The Whiskey Sour is another venerable whiskey based drink with a disputed past and a wealth of variations. Whilst its sharp initial strike of lemon juice can be off-putting to some, it really comes in to its own as an after dinner drink on your summer holidays, and with a slight leniency that reads lemon juice as water, it still fits with our four key ingredient principle. The sours are a whole family of early cocktails that predate their oft-confused but by no mean close relations the Sourz. Sours are categorised, perhaps unsurprisingly by their use of a sour juice (lemon or lime) instead of the water of our traditional Bittered Slings, and other famous sours include the Margarita (tequila, triple sec and lime), Sidecar (brandy, triple sec and lemon) and Daiquiri (rum, sugar and lime). The legend of the Whiskey Sour takes us back to the then Peruvian, now Chilean port town of Iquique in 1872 where Elliot Stubb an English sailor decided to jump ship and open a bar. Stubb experimented with a range of local ingredients and settled on a most agreeable range of aperitifs based around the limon di Pica which he added to any liquor he had to hand. After adding a liberal splash of whiskey and a strong dose of sugar to his limon one day, Stubb hit upon a delicious sweet and tart concoction which he dubbed the Whiskey Sour. Shake a large measure of whiskey, the juice of a lemon, a tablespoon of sugar syrup, half an egg white and four dashes of bitters with ice. To get the frothiest results, shake first with ice (twenty seconds) and then dry shake (without ice) for ten seconds. 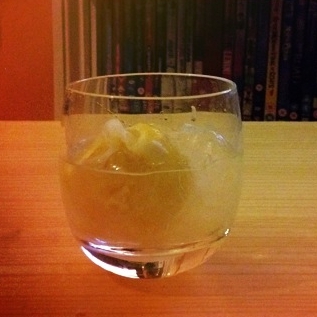 Strain into a rocks glass with fresh ice and garnish with a twist of lemon peel. One of the key variants of this recipe is to omit the egg white, which is only recommended if you find yourself in a Whiskey Sour emergency (who hasn’t? ), or if you’re like me and can’t be expected to separate an egg white at a crowded cocktail party, or don’t expect to need a whole bottle of egg white in your fridge. Ultimately however, the drink is much the poorer for the absence of egg white, so this is strictly to be approved for emergency use only. A far better variant can be obtained by using camomile infused bourbon for a Camomile Sour. This entry was posted in 1800s, Cherry, Digestifs, Egg White, History, Lemon Juice, Sugar, Syrup, Twist of Lemon, Whiskey and tagged bitters, bourbon, egg white, lemon, lemon juice, rye, sours, sugar, sugar syrup, whiskey, whiskey sour.